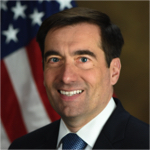 John C. Demers became Assistant Attorney General for the Department of Justice’s National Security Division on February 22, 2018. As Assistant Attorney General, John oversees all units and components of the NSD, including the Counterterrorism Section, the Counterintelligence and Export Control Section, the Office of Intelligence, the Office of Law and Policy, the Foreign Investment Review Staff and the Office of Justice for the Victims of Overseas Terrorism. Prior to rejoining the Department of Justice, John was Vice President and Assistant General Counsel at The Boeing Company. He held several senior positions at the company including in Boeing Defense, Space, and Security and as lead lawyer and head of international government affairs for Boeing International. From 2006 to 2009, John served on the first leadership team of the Justice Department’s National Security Division, first as Senior Counsel to the Assistant Attorney General and then as Deputy Assistant Attorney General for the Office of Law & Policy. Before that, he served in the Office of Legal Counsel. From 2010-2017, he taught national security law as an adjunct professor at the Georgetown University Law Center. John worked in private practice in Boston and clerked for Associate Justice Antonin Scalia of the U.S. Supreme Court and Judge Diarmuid O’Scannlain of the U.S. Court of Appeals for the Ninth Circuit. He graduated from Harvard Law School and the College of the Holy Cross.